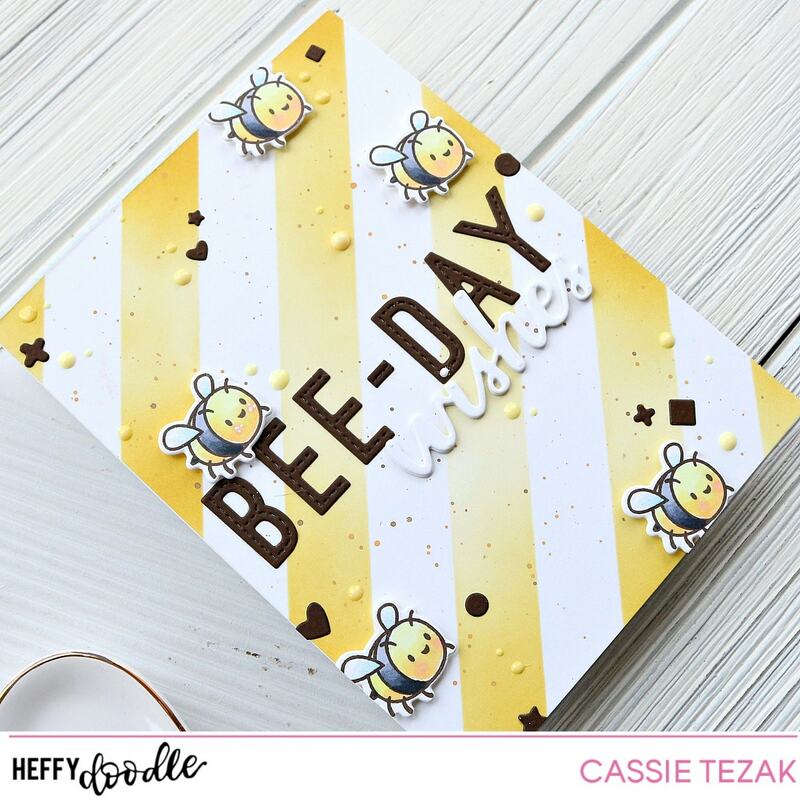 Today I’m sharing a cute punny bee-day card using the super sweet Big Bug Hugs stamp set! Hi, everyone! I’m happy to be sharing another card with you today. I started the card for today by working on the background. I used the Barber Shop stencil and my Fossilized Amber Distress Oxide ink to create the stripes. After ink blending the color on, I smooshed some of the ink on my glass mat in Fossilized Amber and Walnut Stain, watered it down and then used a paintbrsh to flick splatters over the panel. I set the panel aside to dry and started working on the other elements of the card. I stamped out the bee from Big Bug Hugs with some chocolate brown ink that is Copic safe. I’ve been loving stamping with brown ink lately. It’s a dark brown color, so it isn’t super noticeable, but I love the subtle change it brings. I colored all the bees in with my Copic markers and die cut them out with the coordinating dies. Because I stamped the bees in brown I decided to bring in more brown and die cut my letters from the Stitched Alphabetters dies from brown card stock. They were adhered directly to the card panel. Then I die cut the Wishes die from white card stock three times and glued them all together for some dimension. I adhered that just below the letter dies. 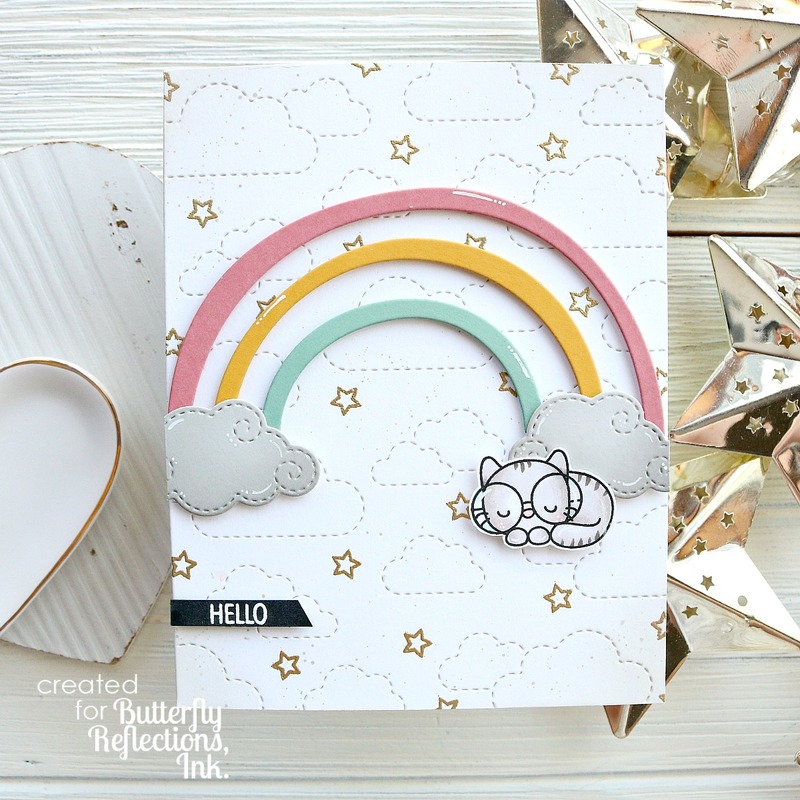 One last piece of die cutting I did was to use all the little tiny shape dies from the Tag Along die set. I cut them from the same brown card stock and adhered them around the card. The bees were adhered with foam tape to the card, to give some added dimension. The final touch was to add some yellow Crystal Nuvo Drops. And that was my card for today! I hope you all enjoyed it. 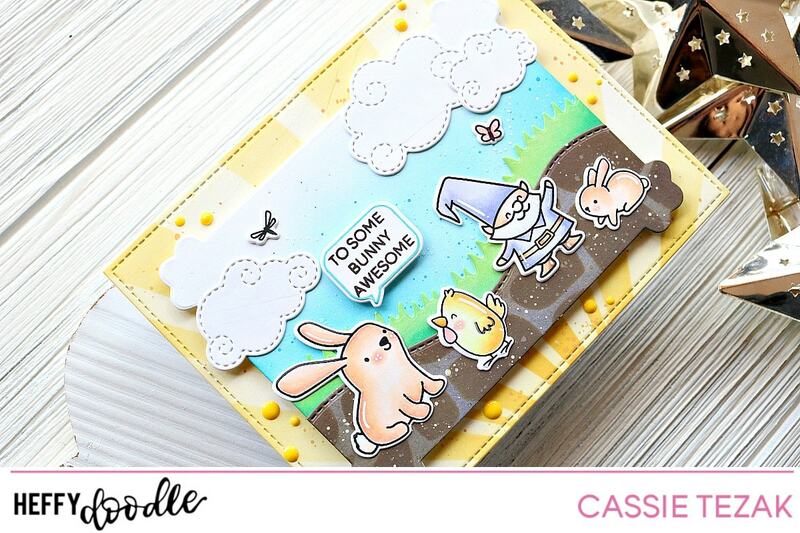 Who else loves creating their own sentiments with alphabet dies and stamps?! Thanks so much for stopping by, and I’ll see you again with another card! Hi, everyone! 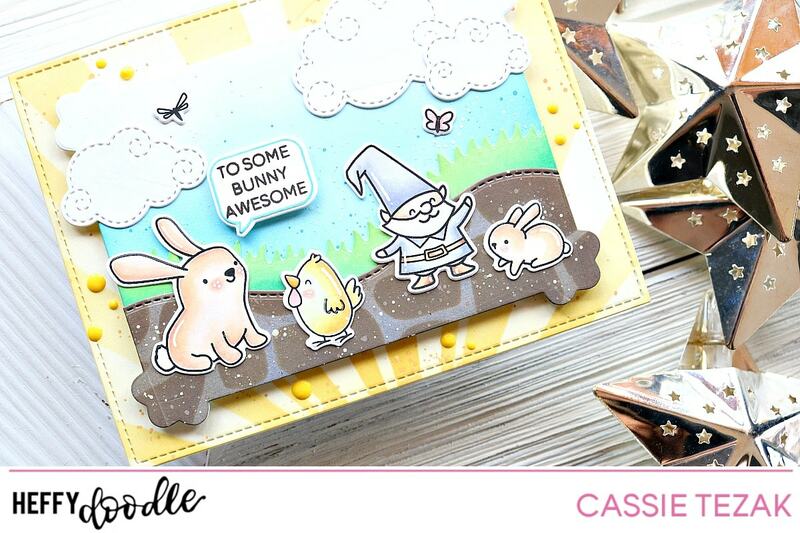 It’s Cassie here, and I’m sharing a cute Spring card using dies and stencils today! I started by doing all of my big die cutting. I die cut the large stitched rectangle and two of the scalloped rectangles from the Clover Frames die set. I also die cut the cloud trio from Swirly Clouds Dies. I ink blended over all of these die cut pieces. On the stitched rectangle I used the Rays the Roof Stencil with Fossilized Amber. Once I had removed the stencil, I added some more ink to the edges so that it wasn’t so harsh. To create the grass and dirt, I took one of the scalloped rectangles and used the Stitched Slopey Joes dies to cut a hilly ground into it. I then turned the scalloped rectangle over and used the Grassy Lass dies to match the hills and cut it a little higher than the dirt so that it would show. On the dirt piece I used the Stoney Maloney stencil to great some texture. I adhered all of those pieces together once I had ink blended all of them separately. The full scalloped rectangle was adhered to the stitched rectangle with foam tape to give it some dimension. Then I got to work on the characters for the scene. I stamped out bunnies from Honey Bunny Boo, a gnome and bugs from Gnome Matter What and the chick from Eggcellent News. I also stamped the speech bubble from Whatcha Sayin’ and a saying from Honey Bunny Boo and die cut them out. All of the characters were colored in with my Copic markers and die cut out as well! Once they were all added to the card, I added some yellow Nuvo Crystal drops around the border of the card as well as some white gel pen detail. And that finished the card for today! Thanks so much for stopping by 🙂 I hope you enjoyed the card and I’ll see you again soon with another one! Hello, friends! I’m back today to share another fun Heffy Doodle card with you all. Today I’m using lots of dies for this cute dino card. Let’s jump right in! I started by die cutting the two tag pieces from the Tag Along dies. The full piece from white card stock and the frame from gray card stock. 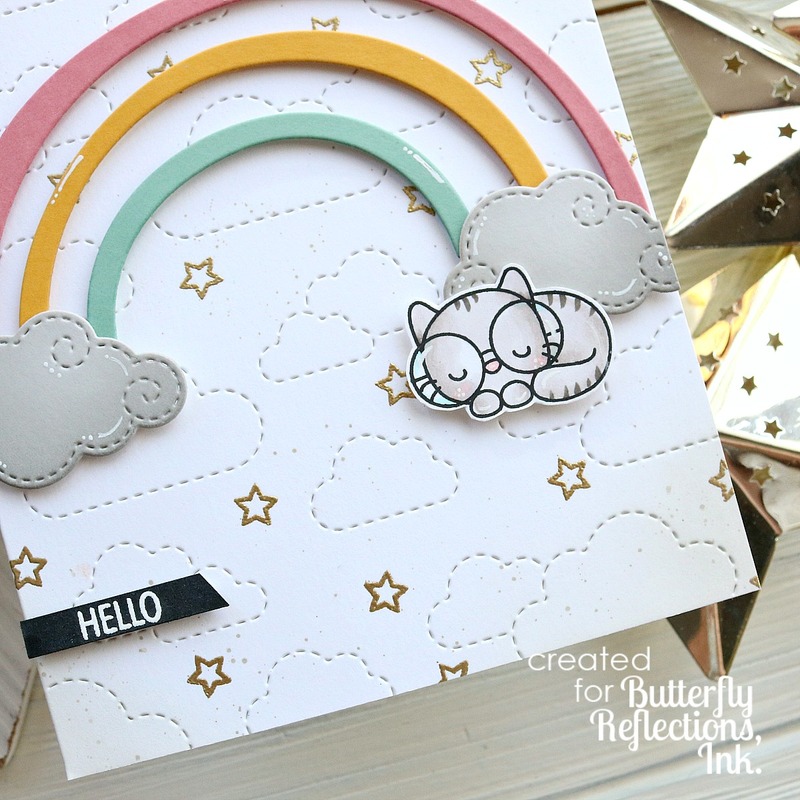 On the white full die cut I used the Rays the Roof stencil to create the rainbow of rays for the background. I also splattered some gold paint over the piece, as I knew I was going to be using more gold later in the card. I adhered the frame to the piece and tied some black and white twine through the hole at the top. The next thing I did was die cut one of the larger squares from the Stitched Square Dies set and ink blended some Broken China Distres Oxide ink over the entire piece. I also splattered this piece with gold paint and some of the Broken China ink for some texture and interest. I love to splatter everything! Next came a lot of die cutting! I die cut all of the different sizes of the Dino Prints dies from white card stock, vellum and gold glitter card stock. Then I arranged the dino prints die cuts all over the square. I heat embossed a sentiment from Whatcha Sayin’ on one of the tiny prints. Once all the footprints were adhered down I adhered the tag down as well with foam tape, and added the final footprints to the tag with the sentiment. Finally, I had one of the dinosaurs from Dino Time already colored and ready to go, so I adhered him to the tag to finsih it off! I love having pre colored and cut images just for that reason 🙂 And my card was finished!! I hope you enjoyed the card I created today. It was heavy on the die cutting, which was fun for a change. Thanks so much for stopping by, and I’ll see you again soon with another card! Hi, everyone! I hope you’re all have a great Thursday! I’m happy to be back sharing another Heffy Doodle creation with you all. Ever since the new release came out I knew I wanted to do something with rainbow robots! Finally I was able to make that idea into a card! Let’s take a look! I started the card by doing all my coloring. I stamped out all of the robots from the Bots of Love stamp set twice and colored them in with my Copic markers, making sure to get all the rainbow goodness! I also stamped and colored a couple other images including the pixel heart and a gear to be made into balloons! Then I fussy cut everything out and set it aside to work on the background. To create my background I took a piece of 110 lb white card stock and the Cogs and Code stencil and did some embossing with my die machine. Carefully, I arranged the stencil so the cogs would cover one corner at a time and ran it through my die machine using a sandwich that applied enough pressure to press the paper into the stencil and emboss the pattern into it. This is one of my new favorite techniques and I want to do it constantly! It adds such a fun element to a card. I also splattered some gold paint over the panel for some interest. I die cut the Birthday die cut from some paper that I had covered with the same gold paint that I splattered over the card panel, and layered it over two other birthday die cuts I’d done. I also heat embossed the ‘overload’ on some black paper and trimmed it down to a strip. Then I put the card together! The robots were added with foam tape, and so were the other elements I had stamped and colored. I attached the sentiment and my card was complete! I hope you enjoyed the card I made for today. 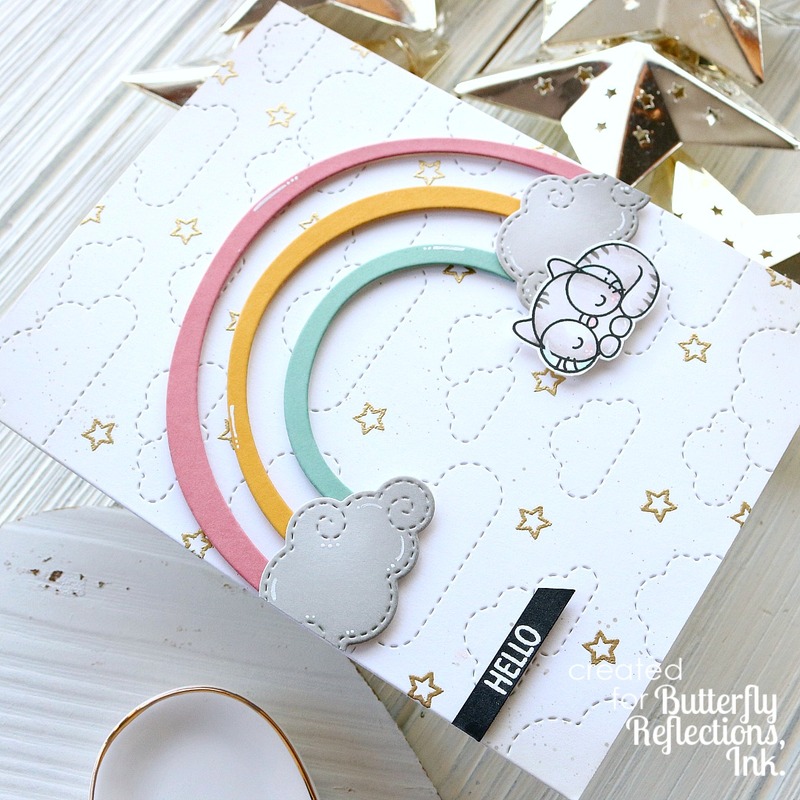 I love a rainbow on a card, and these little robots are too cute. Thank you so much for joining me today, and I’ll see you again soon with another card! Hi, everyone! I’m back today to share a fun card with you all! 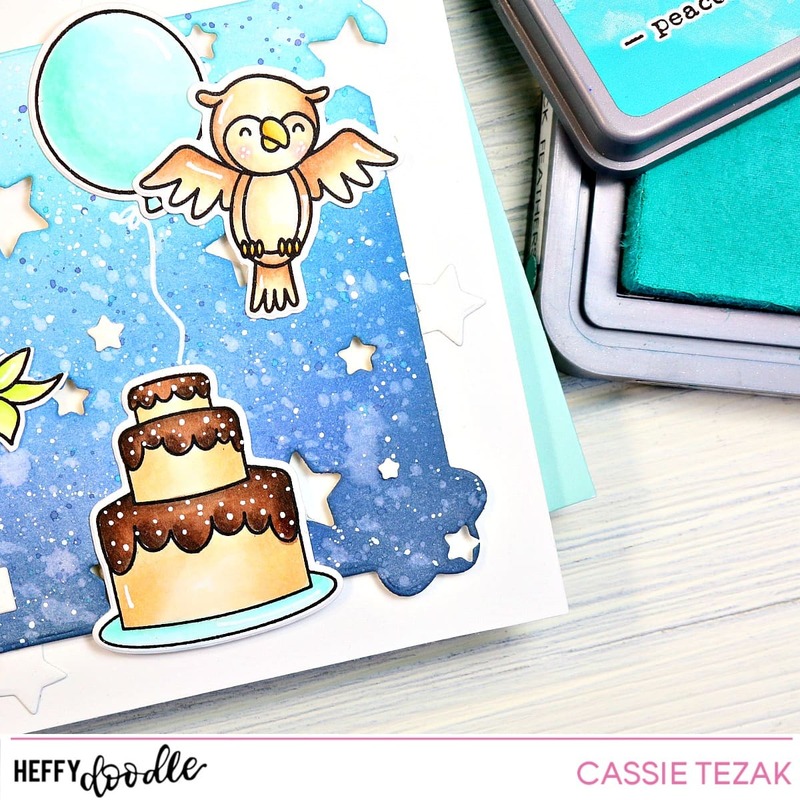 I tried using transfer gel to foil a stencil for this card, and I have to admit-I love the way it turned out!! Let’s get started! I started the card for today with the stenciling. I used transfer gel over the Love Circuit stencil. After applying a even layer and washing the stencil off, I let the gel dry for about an hour. That’s when I used my Minc to foil the pattern with some copper foil. I love the way this turned out, especially with this circuit image!! Next, I did all of my stamping and die cutting. I die cut one of the Stitched Square dies, and die cut the stenciled piece down with one of the Stitched Circle dies. I wanted to make a smaller, square card so I picked sizes that worked for that. I also die cut four of the Party dies to be stacked together, and one of the banners from the Tag Along die set. I heat embossed a partial sentiment onto the banner after coloring it with one of my Copic markers so that it matched the robot I stamped from the Bots of Love stamp set! I love the cute robots in this set! To add some interest to my stitched square I stamped some of the gears from the set with VersaMark, and added some splatter to it and the stenciled piece. To finish the card I put everything together with foam tape and glue, and my card was complete! Thank you so much for joining me today! I hope you enjoyed the card I made, and I will see you again soon with another one!